Back in 2003, developer Quantized Bit showed off Overstorm, an action platformer for the Game Boy Advance at a gaming convention. The title would not be seen again for more than a decade, as it was ultimately cancelled. However, the developer — which is still going strong and creating indie titles — is giving away an alpha version of Overstorm with Indiestand title Volt — its most recent release — which is available on PC, Mac, Linux, Android and iOS. Unseen 64 has picked up on this event and has posted screens and assets from the title, which looks incredibly polished and detailed for a GBA release. You'll need a GBA emulator to play the game — it's supplied in ROM form — and it's naturally far from a finished project, but nevertheless remains a neat extra if you're a Nintendo historian. Whoah it's beautiful. Nintendo should put this on the VC. @BensonUii How can they put it on the vc if it's not a finished game. That makes me want to shoot myself. Thanks to games like spyro, bionicle 1 and scooby doo, I allmost gave up on gaming as a whole... the GBA is nothing but bad memories for me. "Unseen 64 has picked up on this event and has posted screens and assets from the title, which looks incredibly polished and detailed for a GBA release. You'll need a GBA emulator to play the game — it's supplied in ROM form — and it's naturally far from a finished project, but nevertheless remains a neat extra if you're a Nintendo historian." Somehow I missed the part that says "far from a finished project" because I'm multitasking while reading this article. I thought it was finished but was never released so I said Nintendo should jump in. Sorry. I can't be the only one who thinks this looks like Earthworm Jim. @PvtOttobot so over-dramatic. The GBA has some seriously wonderful games. It remains my second favorite handheld system to date. @NImH It doesn't change the fact that MY experience SUCKED! Dang, this looks cool. Too bad it never got fully released. Nope. I was thinking the same thing! Especially that first screenshot there. @PvtOttobot Are you implying that you dislike Spyro? I didn't know that was possible! Awesome, I'll just download the game, flash the rom to a SuperCard and play it on my GBA SP instead. No point in playing it on iOS and Androids. To me, the GBA Spyro games were the go-to portable Spyro entries until the PSP ports of the original PS1 trilogy (which, for us Europeans, meant waiting until December of 2012, although it was well worth it), as buggy as Season Of Ice was. As a whole, though, I can't say the GBA's been bad memories for me. "Bionicle 1 and Scooby Doo" means two games out of three you played were licensed games, and it's almost common knowledge that playing licensed games is often (but not always) asking for trouble. Even within the excellent range of first/second-party games, the only bad memories I have with GBA come from being unable to bring my Pokémon from Pokémon Gold and Silver to Ruby and Sapphire - a wound that the Pokémon Bank compatibility in the latter's remakes has healed already (completing the path of redemption started by FireRed and LeafGreen and continued in HeartGold and SoulSilver). As for this game itself, it looks amazing. 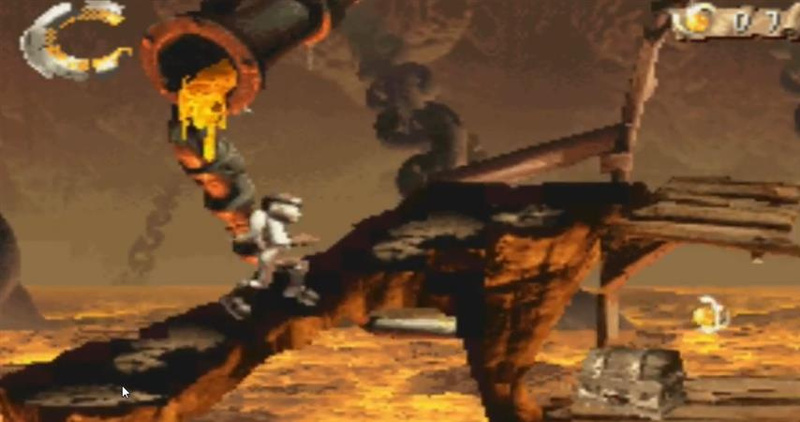 Adding to the comparisons to Rayman (for the enemies) and Earthworm Jim (for the protagonist), I'd draw one to Oddworld for the grim and gritty atmosphere, which for once is a good thing! The deserted world looks stunning on a GBA screen, and why the game was cancelled is truly beyond me. Hopefully someone will fund a remake of Overstorm via Kickstarter, maybe for the 3DS so we'll finally see a GBA game on 3DSes again (or at all for non-ambassadors). Follow the bread crumbs game it looks a lot like Earth worm jim. @AlexSora89 Dude, I was like 8 with NO prior videogame knowledge, I just got a bad hand, sheesh kabeesh! @PvtOttobot I feel sorry for you because the GBA is home to several great gaming experiences. Really nice! The GBA demo ROM was dumped and i remember I played this. Woah! They should polish this up, 3Dize it, then release on the 3DS Eshop. Looks cool and would look sweet with some 3d depth to it. Nintendo could have an unreleased projects section for the VC. If these devs are willing to finish up the loose ends on unfinished games that are near completion, it would make an interesting collection of games. Looks pretty nice. Almost like a more serious Earthworm Jim. Maybe finish it, and release it as a download?